Not every Academy Award winner for Best Picture stands the test of time. Rain Man is one of the winners that, 22 years later, still passes the test. Rain Man won Oscars for Best Picture, Actor in a Leading Role, Directing, and Writing. It was also nominated for Art Direction, Music, Film Editing, and Cinematography. Other Best Picture nominees: Working Girl, The Accidental Tourist, Dangerous Liaisons, and Mississippi Burning. Other Best Actor nominees: Gene Hackman (Mississippi Burning), Tom Hanks (Big), Edward James Olmos (Stand and Deliver), and Max von Sydow (Pelle the Conqueror). The story is pretty straightforward: Charlie Babbitt (Tom Cruise, All the Right Moves) is a selfish guy who sells high-end sports cars on the gray market. It doesn’t faze him one bit when his dad dies because they had a falling out years earlier; it was a falling out that was at least in part driven by Charlie’s selfishness and his father’s attempts at being disciplinarian. At the reading of his dad’s will, Charlie is upset to find out he’s inheriting only the Buick Roadmaster that played into the strained father-son relationship and some rose bushes while $3 million are left in a trust. But Charlie also finds out he has an older brother, Raymond (Dustin Hoffman, Tootsie), who’s been voluntarily committed to an institution as an autistic savant. Being the selfish, rather greedy individual that he is, Charlie effectively kidnaps his brother in hopes of bringing calmer heads to terms and splitting the inheritance between the two of them. The movie then turns into a road trip of personal growth for Charlie and unlikely male bonding, with Charlie and Raymond reconnecting. Charlie has no choice but to adapt to his brother’s intransigent habits (gotta be in front of the TV for Wapner and Wheel of Fortune; if there’s no maple syrup and toothpicks, forget about eating pancakes). But what really makes Charlie’s heart start to thaw is the discovery that the once-lost-now-found brother who’s caused him so much frustration was the Rain Man who’d sing to Charlie whenever he got scared when he was a little boy. Given his tender age when their mom died and Raymond moved away, Charlie had written off Rain Man as nothing more than one of childhood’s imaginary friends. Barry Levinson’s a very clever filmmaker and Rain Man epitomizes his spectacularly subtle sensibilities in both humor and heart. While reviewing the Blu-ray’s supplemental materials, it’s revealed one of the most outstanding ideas Levinson brought to Rain Man was the notion that Charlie’s girlfriend should be of a foreign nationality, a young woman who could act, in effect, as an interpreter for the audience, trying to understand Charlie’s world from an outsider’s perspective, and in turn bringing the theatrical audience into the narrative loop as well. Fortunately for Levinson, he found the perfect girl in Valeria Golino (Big Top Pee-wee). And Tom Cruise took major strides to overcome the empty pretty boy image cultivated in movies like Top Gun and Cocktail. His performance in Rain Man is still one of his very best. As for Rain Man himself, Hoffman rose triumphantly from the ashes of Ishtar, unloaded on theatergoers in 1987, and deservedly took home the Oscar for Best Actor. The supplemental materials shed a little light on Hoffman’s concerns about getting a handle on his character; indeed, it’s a challenging role, one that easily could have come off totally wrong. Watching the movie now, there’s something so pitch-perfect about all the main cast members as they hit their marks and create fully-realized characters, it reasserts the magical nature of the moviemaking process. Combine the cast with a heartful drama that mixes in good humor without compromising any of the characters’ integrity and the end result is a great story well told. When things click, they make history. This Blu-ray release features the bulk of the supplemental materials included on previous DVD releases, excluding the photo gallery found on the 2004 DVD edition. While there’s nothing new here, the main collection of features, particularly the three running commentaries, is excellent. Barry Levinson’s commentary track has patches of silence, but there are also plenty of nice insights into the filmmaking process. Thoughts about the dialogue, the score, pacing, editing choices, the idea of the foreigner who allows for some situational exposition; all those topics and much more are covered in his track. The second track, by co-screenwriter Barry Morrow, is exceptional. As the originator of the story, Morrow offers a lot of interesting insight into the movie’s development, particularly the real-life experiences he had that informed the movie. There’s also a surprising anecdote about Forrest Gump being in development concurrent with Rain Man. Of course, Forrest Gump wouldn’t make it to the screen for another 6 years. In many respects, Morrow’s track is exactly how a track should be done. He doesn’t labor over syncing his comments with on-screen activity; he has stories to tell about the genesis of the movie and the journey through development. Oh. And imagine, if you will, what Rain Man would’ve been like had it starred Dustin Hoffman and Bill Murray. That was a distinct possibility at one point. And there was the studio’s request that Rain Man and Charlie get involved in a shoot-out with a gang of survivalists in order to add some action to the middle of the movie. Yikes! The third track, by co-screenwriter Ronald Bass, is also great. It starts off with background on the creative differences and talents that tinkered with Rain Man before it finally made it to the big screen. There was Martin Brest (Beverly Hills Cop, Midnight Run), who bowed out because of creative differences, then Steven Spielberg (The Color Purple, Empire of the Sun) moved it along, but regretfully had to pull out in order to make Indiana Jones and the Last Crusade, then Sydney Pollack (Out of Africa, Tootsie), finally Barry Levinson (The Natural, Good Morning, Vietnam). Bass talks about the rush to drop off the completed screenplay right before the writers’ strike kicked in. He also talks about the rush felt when a movie connects with audiences, as was the case with Rain Man. The Journey of Rain Man is a well-done 22-minute retrospective from 2004 on the making of the movie, including chats with Barry Levinson, Barry Morrow, Ronald Bass, Valeria Golino, and Hans Zimmer. It’s particularly interesting listening to Zimmer explain the conceit behind the score. He and Levinson set up two rules: “no jangly guitars” and no string section. Instead he came up with what he describes as an African-Cuban-electronica hodge-podge. Lifting the Fog: A Look at the Mysteries of Autism is a good, high-level, somewhat glossy look at autism. 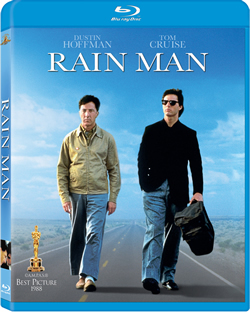 The 20-minute featurette includes an interview with Peter Guthrie, whose mannerisms were clearly a source of inspiration for Hoffman’s Rain Man. Guthrie died in 2009; he was only 58 years old. Also included are the theatrical trailer and one deleted scene, a 2-minute cut of Raymond in a convenience store, munching away on snacks to the displeasure of the store owner, who’d like Raymond to pay before consuming the goods. The picture is thoroughly serviceable. Film grain is particularly evident in darker scenes, typically those shot indoors. The English 5.1 DTS HD Master Audio track is surprisingly good, particularly when the sound offers more surround activity via the musical tracks. That’s not to say it’s showcase material, but it’s well-done for a 22-year-old soundtrack. Also available is an eclectic selection of language options: Spanish mono, French 5.1 DTS, Portuguese mono, German 5.1 DTS, Italian 5.1 DTS, Castilian 5.1 DTS, Czech 5.1 Dolby Digital, Hungarian (Magyar) mono, Polish 5.1 Dolby Digital, and a track that looks to be Russian 5.1 DTS. Subtitles are also available in a extensive array of options: English for the Deaf and Hard of Hearing, Spanish, French, Portuguese, Brazilian Portuguese, Danish, Finnish (Suomi), German, Italian, Dutch, Norwegian, Russian, Castilian, Swedish, Croatian, Czech (Magyar), Greek, Hungarian, Bahasa Indonesian, Hebrew, Polish, a few Asian options, Limba Romana, Slovenian, and Turkish. Enjoy the movie, of course. For the writers in the audience, be sure to check out at least one of the commentary tracks by Barry Morrow and Ronald Bass. For those in a rush, watch The Journey of Rain Man for a condensed, but excellent, look back at the making of the movie.